Did NC State Really Steal from ECU? For Saturday’s homecoming game against UNC-Chapel Hill, N.C. State will debut a new midfield logo with Wolfpack imagery inside the outline of the state of North Carolina at Carter-Finley Stadium. 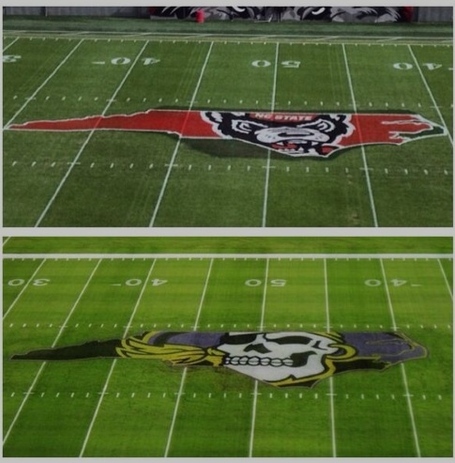 If that sounds vaguely familiar, it’s because East Carolina debuted an unavoidably similar midfield logo with a Pirate head in 2009 and has used it the past four seasons. Over that time, it has become one of the signature elements of Dowdy-Ficklen Stadium, instantly recognizable on television broadcasts. N.C. State has used variations of the wolf-inside-the-state logo before on bumper stickers and billboards and in publications. While the logo was specifically installed for homecoming, there is no timetable for its removal. The Pirates visit Carter-Finley on Nov. 23. “Imitation is the sincerest form of flattery,” East Carolina spokesman Tom McClellan said.